With an eye on promoting eco-friendly transport, the government will be ready with its electric vehicle policy by December. Nagpur today earned the distinction of becoming the country’s first city with electric fleet of 200 electric vehicles, including taxis, buses, e-rickshaw and autos. “Promoting electric vehicles is our priority. We want electric buses, autorickshaws and other vehicles to ply in the country. We are engaged in initial talks with SoftBank for loans at low interest rate for a green project. We want to introduce 2 lakh electric buses for public transport,” Road Transport and Highways Minister Nitin Gadkari said on Friday. He was addressing the media here before the launch of a pilot project for 200 electric vehicles, including 100 of Mahindra’s new e20 plus. The Union minister, along with Maharashtra Chief Minister Devendra Fadnavis, inaugurated India’s first multi-modal electric vehicle project at the Nagpur Airport Complex here.With this, Maharashtra has become the first state to provide various incentives to e-taxis. “Electric mass mobility ecosystem in Nagpur will bring about a transformational change in the automotive and transportation landscape in the country,” Gadkari said after the launch. Taxi aggregator Ola has already invested upwards of Rs 50 crore towards EVs and charging infrastructure, starting with 50 plus charging points across four strategic locations in Nagpur. Gadkari said the target is to reduce the ticket fare of public transport by 50 per cent in the country and charging these vehicles will not be an issue as charging stations are being set up. The size of the automobile industry, which is at Rs 4.5 lakh crore, is estimated to grow to Rs 25 lakh crore and stress should be laid on promoting environment-friendly vehicles that causes minimum pollution, he suggested. 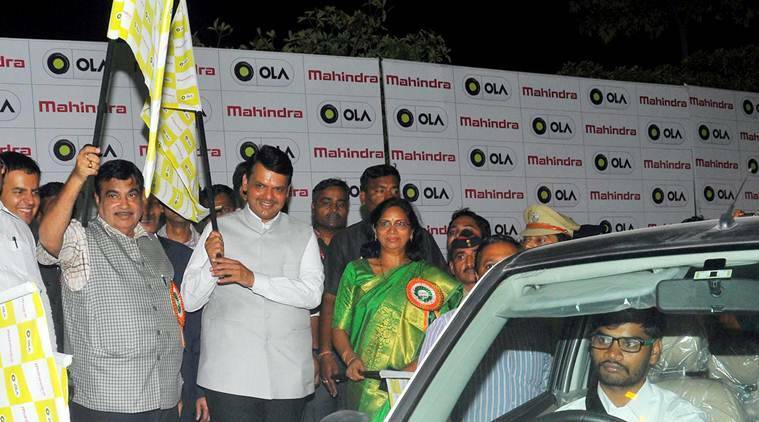 The state government will gradually ramp up the operations of electric taxis in all major cities of Maharashtra. Pawan Goenka, MD, Mahindra and Mahindra, said the company will lead this charge in India with the government. Bhavish Aggarwal, co-founder and CEO, Ola, stressed that electric mobility in a multi-modal format will be the key towards realising the company’s mission of building mobility for a billion Indians. With an eye on promoting eco-friendly transport, the government will be ready with its electric vehicle policy by December. Accelerated adoption of electric and shared vehicles could save USD 60 billion in diesel and petrol cost while cutting down as much as 1 gigatonne (GT) of carbon emission for India by 2030, government think-tank Niti Aayog said in a joint report with Rock Mountain Institute earlier this month. A group of ministers, constituted to prepare the draft plan for the electric vehicle policy, has submitted recommendations to the Cabinet secretary and is now preparing the draft plan. A number of Indian companies have also shown interest in investing in electric vehicles and the related infrastructure. The policy will include both light and heavy weight electric vehicles like cars and buses. Dispelling concerns on lack of infrastructure for charging such vehicles, the minister said a charging station is being set up. Gadkari also said he will soon be meeting Finance Minister Arun Jaitley to request for a lower tax slab for vehicles run on ethanol, bio diesel and bio CNG. “I will also request him to reduce tax rate on hybrid vehicles in order to tackle air pollution in the long run,” he said. The NITI Aayog report estimates that India can conservatively save up to 64 per cent of anticipated passenger mobility-related energy demand and 37 per cent of carbon emissions by 2030. At current oil prices, this will imply a net fuel cost saving of approximately Rs 3.9 lakh crore by 2030, the report said. According to Gadkari, there are big plans to develop low-cost lithium-ion batteries in India and efforts are on to remodel the battery made by Indian Space Research Organisation to make it fit for use in electric vehicles. Maruti Suzuki has evinced interest in developing lithium ion batteries, he added. The government is aggressively trying to push sales and production of electric vehicles in the country through schemes such as FAME India, which have caught the fancy of Chinese automobile manufacturers such as BYD and SAIC that are already investing heavily in electric technology. “It is our policy to encourage electric cars and buses. Shortly, I will be coming out with a policy regarding this. Hybrid cars should also be encouraged, it saves fuel,” he explained. Electric and hybrid vehicles along with alternative fuel like ethanol are gaining traction as part of efforts to reduce India’s crude oil import bill. “We import crude worth Rs 7 lakh crore. Electric, ethanol, bio diesel, bio CNG are import substitutes and cost effective, pollution free and indigenous too,” Gadkari added.